From demonetization to GST to its relations with the RBI, the Modi government has an economic management problem. Earlier this week, Urjit Patel became the second governor of the Reserve Bank of India—the country’s central bank—to leave office amid tensions with the government of India. In 2016, Raghuram Rajan, his predecessor, announced that he would not serve a second term, which later was revealed to have been due to a lack of an extension of an offer from the government. These doldrums come with just about six months left before Indian voters deliver a verdict in the country’s 2019 general elections. While the Bharatiya Janata Party remains in a dominant position nationally, Indian politics is known for the strength of anti-incumbency. Since 2016, the Modi government’s record on economic matters has suffered. Though the BJP came into power promising “minimum government, maximum governance,” it has botched major economic initiatives. One of these, demonetization, was a self-imposed wound—one that the government continues to insist was for the better. As evidence, consider that Patel’s replacement is none other than Shaktikanta Das, one of demonetization’s chief promoters as finance secretary. The other botched economic initiative by the central government has been the implementation of the nationwide Goods and Services Tax. Finally, external factors have been unkind to the Indian government in 2017 and 2018: a strengthening U.S. dollar and a relative rise in oil prices from 2015-2016 have posed additional challenges. This year, the Indian rupee has reached record lows against the U.S. dollar, benefiting Indian exporters, but spooking the country’s urban middle class. The RBI under Patel was hesitant to intervene too aggressively lest it intensify the country’s liquidity crunch. Heading into an election year, it appears as if the BJP and Modi will be uninterested in shifting course on economic management. Demonetization, GST, RBI independence, and even the padding of GDP growth statistics together tell a story of a party adrift and unable to deliver on the promises made back in 2014. Meanwhile, the results of the latest assembly elections don’t bode well for the party either. Given the disunited opposition and an Indian National Congress that continues to tread water politically, the BJP is still positioned well going into the 2019 elections. 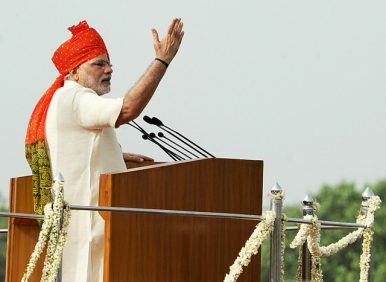 However, Indian voters as well as international investors won’t be encouraged by the government’s economic stewardship in the second half of what may be Modi’s first term.